Subway has introduced a new toasted sandwich via their Subway Dinner Theater website (a site 'hosted' by former SNL actor Jon Lovitz). The new sandwich is called the Bourbon Chicken Sandwich. 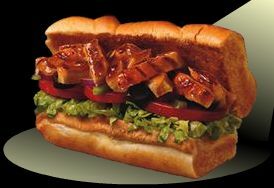 The Bourbon Chicken sandwich is a "fresh Toasted sandwich of all white meat chicken strips, glazed with a non-alcoholic, Bourbon Street-inspired sauce that perfectly complements the chicken, all topped by your favorite vegetables, and placed on your choice of freshly baked, gourmet breads." Since Subway does publish nutrition data for their sandwiches (unlike Quizno's! ), I'll share them here. The 258 gram 6" Bourbon Chicken has 350 calories, 45 calories from fat, 5 grams of fat 1.5 grams saturated fat, no trans fat, 50 mg cholesterol, 1020 mg sodium, 54 grams carbohydrates, 4 grams fiber, 16 grams sugars, 25 grams protein.